Grandma, Uncle and I had dinner at Bistro Burger in San Francisco Centre and headed over to the theater after. During the walk, Grandma tripped and fell on Market Street. She had a bit of bruising but seems to be okay otherwise. It definitely scared me as I was already pretty banged up and know what a fall can lead to. I ended up taking a balcony seat in the second to the last row and letting the three others sit together near the front of the orchestra section. Blithe Spirit tells the tale of a wartime England author, a series of seances and what transpires in between. Ghosts, living folks and the environment interact in a dark comedy where people laugh, cry, live and die. It was a really well done production and extremely well cast. Angela Lansbury plays the spirit medium Madame Arcati and even though she is 89 years young, she still has a commanding presence on the stage. Even when a wardrobe malfunction occurred and her hat wouldn’t stay on her head, a quick bit of improv and Arcati was dancing about in the midst of a seance. While Lansbury doesn’t have the largest role in the play, she truly is the heart of the production. She is surrounded by fine British actors who have performed in such television and film roles as Hitchhiker’s Guide to the Galaxy, Downton Abbey, Atlantis, Hex, Monty Python’s Life of Brian, Batman Begins, The Importance of Being Earnest, Orange is the New Black, Law and Order SVU and plenty of stage and audiobook credits. 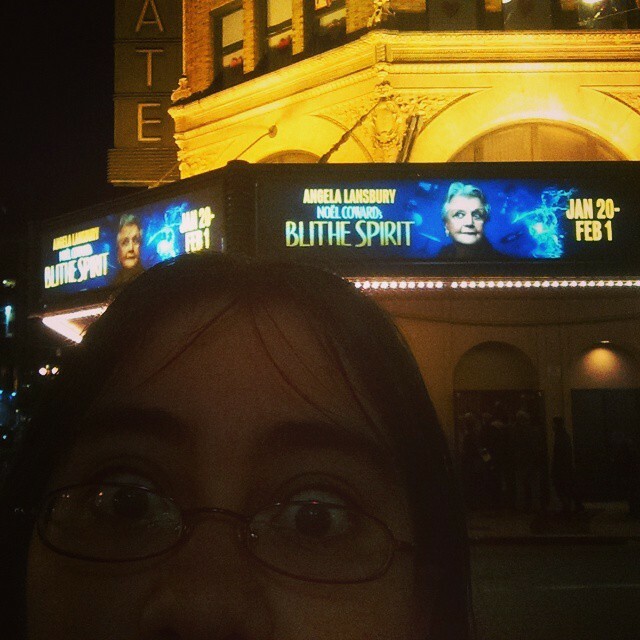 I was greatly impressed by the entire cast and found the play to be highly entertaining. The crowd consisted of almost entirely folks of retirement age, who were there for an in-person look at Lansbury more than the play content. Disappointingly there were a few folks in my balcony section who left after the first act and didn’t return. My ankle, which was injured prior to our trip to South Texas, was not happy with the lack of railings and high staircases to my seat. My wife and her family members were happy with the show and their seats. It was worth it. My thought was that Lansbury has still got it and it was a great evening out. I am a leaf in the wind.